A spiritual battle is simmering between the Vatican and a popular shrine to the Virgin Mary in Bosnia and Herzegovina, the New York Times reports. The Vatican is investigating the shrine’s main claim to fame: that the Virgin Mary makes regular, in-person appearances. They are skeptical. “The Congregation [for the Doctrine of the Faith] has affirmed that, with regard to the credibility of the ‘apparitions’ in question, all should accept the declaration … which asserts: ‘On the basis of the research that has been done, it is not possible to state that there were apparitions or supernatural revelations,’” Archbishop Carlo Vigano wrote in an Oct. 21 letter to the bishops of the U.S., sent to the general secretary of the U.S. Conference of Catholic Bishops. Already, since the pope announced in June that a decision was imminent, the numbers of Italians — once the bulk of the pilgrims here — have fallen by half. “Whatever the verdict turns out to be, this wait is creating a state of uncertainty for the pilgrims, and that affects the season,” said Sante Frigo, an Italian married to a pilgrim guide in Medjugorje. 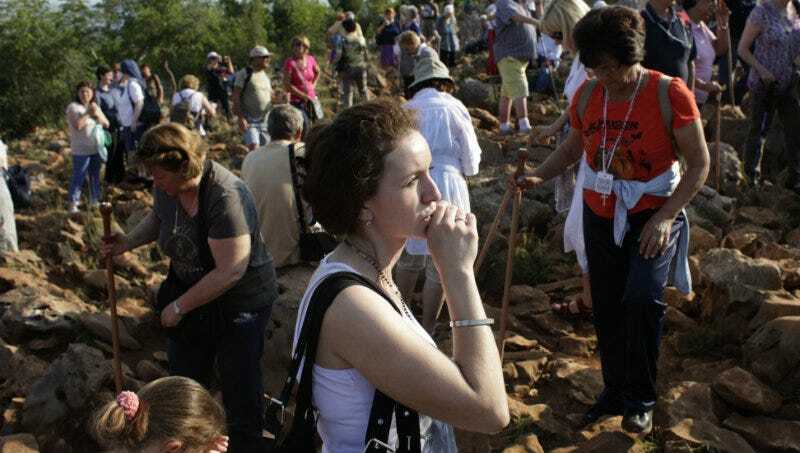 Pilgrims pray at the hill where the Virgin Mary is believed to have appeared, Medjugorje, Bosnia and Herzegovina, June 2012. Image via AP.